Here's the fpp on the subject from 2012. This story is wild. The sheer effort that went into the fraud is astonishing, to the point where you wonder why Kurniawan went into fraud as he clearly had the brains for... anything else he wanted to do in life. 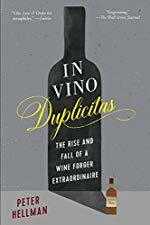 The author of the book is a renowned wine journalist who knew quite a few of the players in this story as the chaos unfolded. One of the dupes was a Koch! It's a hell of ride from start to finish, and you'll never look at wine the same way again. Just read this due to your recommendation. Such a fascinating world and always love a con man story. The documentary I watched on Netflix about him is also amazing. Great recommendation! Now to check out your others!